A USLHE Hand Lantern front view. We do not think the lantern base for this is correct as it says Fire Dept on it. The globe however, is authentic and fit a very similar lantern. Hand lanterns were issued to each lighthouse and always marked as such. Pictured to the left is USLHE hand lantern. The globe is an original globe, but the base of this lantern says Fire Dept on it. It at least shows an example of the cast USLHE into the globe indicating it was for the US Lighthouse Establishment. As it is marked USLHE, it is older than the USLHS lanterns pictured on our site. 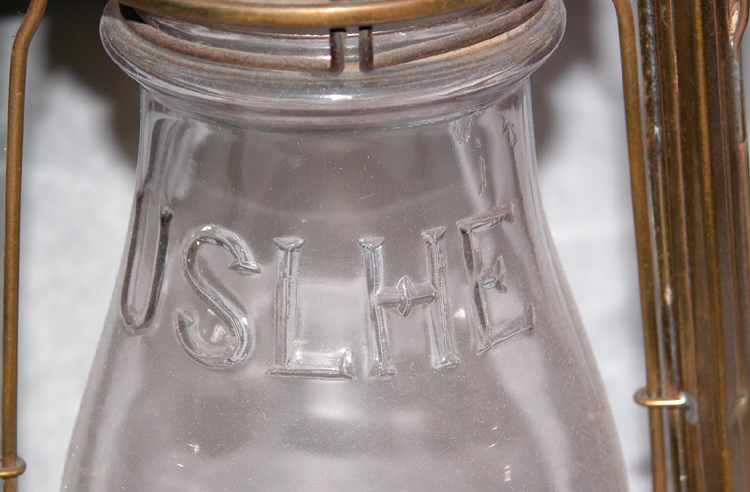 Close up of the US Lighthouse Establishment name on the front of the lantern cast into the glass with the initials U.S.L.H.E. located on the top of the globe.